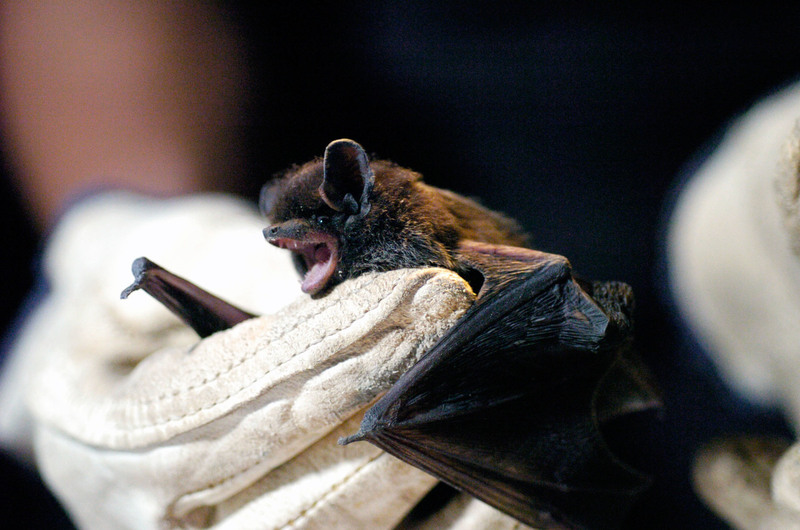 A Woman Dies Of Rabies After Waking Up To Find A Bat In Her Bed : Shots - Health News When a Wyoming woman fell ill, no one suspected that she could have rabies from a bat in her bedroom. Health officials say sleeping in a room with a bat is a rabies risk because bites are hard to see. A silver-haired bat, the type that transmitted rabies to a woman in Wyoming after apparently biting her while she slept. The woman didn't seem to have any bite wounds, so the couple didn't call a doctor, according to an account of the incident published Thursday in the Centers for Disease Control and Prevention's Morbidity and Mortality Weekly Report (MMWR). More than a month later, after she had been hospitalized for eight days for a mystery illness, her family remembered the bat. Lab tests quickly showed that her slurred speech, weakness and respiratory failure were not from Guillain-Barre syndrome, as doctors had thought, but from rabies. This was the first confirmed rabies infection in Wyoming since the state started documenting reportable infectious diseases in 1911. The woman's husband, another family member and 22 health care workers had to receive post-exposure rabies treatment. Two other people who had contact with the woman also chose to receive the treatment, despite not having exposures that would necessarily require it. All of this could have been prevented if the family had understood the risk of rabies. But they never got information that could have helped them — even though they had made multiple phone calls to officials over the years to talk about the removal of bats that lived under the eaves of their home. The woman's husband had even consulted "a county weed and invasive species authority" about the nighttime bat incident just days after it occurred, but was not told about the risk of rabies or referred to a doctor, according to the MMWR report. Rabies is rare in the United States, with only one to three human cases occurring here each year. But any potential exposure to a bat has to be taken seriously, because bites can be extremely hard to detect and cases of rabies have occurred in the absence of a recognized bat bite. That's why people are considered to be "exposed" even if they were just sleeping in the same room as a bat. Someone who's drunk or incapacitated, a child, or a mentally challenged person may also need prophylactic treatment if they're found to be in a room with a bat. Public health officials say that another human rabies death back in 2011 involved similar missed opportunities. In that case, a South Carolina woman woke up to a bat in her bedroom and shook it out of curtains through an open window. She believed she'd had no direct contact with the bat, and did not seek medical attention. When she talked with a local service about removing the bats in her home, she was reportedly not given advice about possible rabies risk or referred to public health officials. "Lack of referral to guidance concerning health risks associated with bats living in the home was possibly a missed opportunity to prevent rabies infection," public health officials noted. The bottom line: Rabies is almost always fatal, unless people get preventive treatment. And rabid bats have been documented in all 49 continental states. People who encounter bats may call up a diverse array of wildlife and pest experts for advice, and health officials say that advice needs to include accurate information about the risk of rabies, even in the absence of a visible bite wound.